PC's Place (tutor and computer lab) is open for business and waiting for customers! The LMC opens its doors from 7:00 to 7:35 Monday through Friday so that students can get homework help in a variety of school assignments and work on the computers. 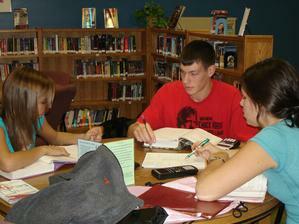 During these hours, students in the LMC will tutor in math, English, social studies, science, or any other subject. Computers are also available for the completion of writing, research, or desktop publishing assignments. Trained staff will supervise your student when attending PC’s Place.